The two essential things that made the film more tolerable was Anthony Hopkins and Laura Haddock, two Brits who brought some performance parts that made me laugh in their earnestness – Sir Anthony was particularly bizarre. The story is tied into the Arthurian legend, and begins on a knights-of-the-round-table battlefield, and somehow that gave a bit more understanding to what was going on, which was decidedly lacking in previous films. The rest will be pretty familiar to the Transformers’ universe and fan base, which surprisingly I guess I’m in tune with… no thanks to director Michael Bay, who still could have cut a good 45 minutes out of the running time. But this is the very definition of the “summer movie,” no more nutritious than the oil-slathered popcorn and giant Coke, and decidedly critic proof. The film begins in King Arthur’s time. We find out the source of Merlin (Stanley Tucci) the Magician’s wizardry, which is an Autobot, naturally. The power is contained in a magical staff, which only Merlin can control. Meanwhile, in the present day, Autobot Optimus Prime and the Transformers are barred from earth, and a special military task force has been formed to hunt them down. 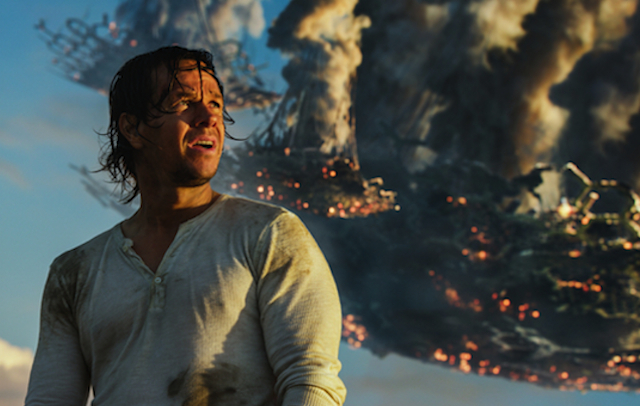 But Cade Yeager (Mark Wahlberg) still harbors some Transformers fugitives, and rescues a young girl Izabella (Isabela Moner) because of her sympathies to the crew. During the rescue he is given a talisman that is part of the Merlin staff, and with its power becomes “the last knight.” Cade is then brought to England by the mysterious Sir Edmund (Anthony Hopkins), who teams him up with Professor Viviane (Laura Haddock), a direct descendant of Merlin. They are the last best hope to sway the earth’s destiny, as the Transformers’ home planet, Cybertron, is hurling towards our planet with the intention to destroy.